After clinching the FIA World Rally Championship manufacturers’ title in 2018, and inspired by the motto ALL FOR WIN, the TOYOTA GAZOO Racing World Rally Team will be pushing the limits for better in 2019 with a fresh assault on all three championship crowns. Epic jumps, sensational slides and terrifying top speeds, the WRC is the ultimate vehicle test bed. After 17 years away, we are hungrier than ever to fight on the world’s most extreme roads, and achieve our goal of making ever-better cars for all. The Yaris WRC is a new generation World Rally Car that incorporates a high-performance engine, intelligent 4WD system and finely-tuned aerodynamics. Fresh from championship success in 2018 and armed with the lessons of two years’ fierce competition, the 2019 Yaris WRC is ready to be pushed to the limit on the world’s most demanding rally stages. 1.6-litre, in-line 4-cylinder direct injection engine. Twisty turns, unforgiving roads and durable hard tyres. Lowered suspension is a must-have for high-speed events such as Tour de Corse. Rutted roads, rocky tracks and a range of tyre compounds. Raised gravel suspension is crucial for hot weather events such as Rally Mexico. Frozen roads, snow banks and studded tyres. A loose-surface suspension setup is essential for sub-zero events such as Rally Sweden. Born with rally DNA, the limited-edition Yaris GRMN road car was tuned and tested on the Nürburgring Nordschleife, reigniting the spirit of hot hatches from the past. Through its combination of power, precision and performance, the Yaris GRMN reignites the spirit of hot hatches from the past. Rally Sweden: Preview The Toyota Yaris WRC will return to Rally Sweden, scene of its maiden victory, for round two of the 2019 FIA World Rally Championship season. Rallye Monte-Carlo: Day 4 Ott Tänak has delivered a podium for the TOYOTA GAZOO Racing World Rally Team on the opening round of the 2019 season, with a superb fightback on Rallye Monte-Carlo. Rallye Monte-Carlo: Day 3 TOYOTA GAZOO Racing World Rally Team enjoyed a strong Saturday on Rallye Monte-Carlo. Ott Tänak won all four stages, and the Toyota Yaris WRC posted the two quickest times on every test. TOYOTA GAZOO Racing World Rally Team launches at the Autosport International Show Joining the team for this year is the British crew of Kris Meeke and his new co-driver Seb Marshall, and the Autosport International show – a popular annual curtain-raiser to the motorsport season – represents their first official appearance on home ground with the team. The latest TOYOTA GAZOO Racing news from each round of the WRC. Led by four-time world champion, Tommi Mäkinen, the TOYOTA GAZOO Racing World Rally Team’s fast and experienced line-up is primed and ready to push the limits in 2019. The sky’s the limit: Toyota in the WRC After a successful debut in 2017, TOYOTA GAZOO Racing head into the 2018 FIA World Rally Championship with more knowledge, an improved car and a dynamic driver line-up, ready to push the limits for better. TOYOTA GAZOO Racing From deserts to dunes, gravel to snow, day to night, we’re committed to overcoming every limit to make ever-better cars. Discover more about TOYOTA GAZOO Racing’s motorsport activities. 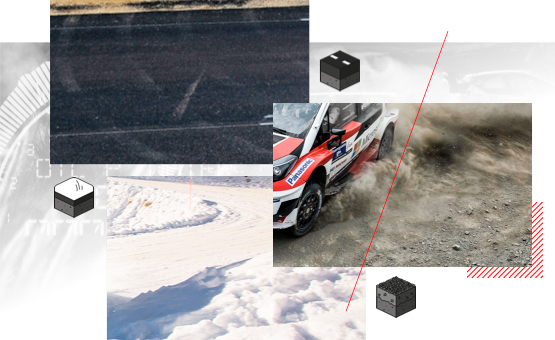 The tougher, the better: Toyota at the Dakar Rally Under the extreme conditions of motorsport, we forge new technologies and in the toughest challenges, find new solutions and new ways to improve. One race typifies this spirit more than any other: the Dakar Rally. Here, quality, durability and reliability are vital. Toyota’s fight for Le Mans victory In a personal testimony, Toyota president, Akio Toyoda, reflects on the heartbreak of TOYOTA GAZOO Racing’s entry in the 2016 Le Mans 24 Hours race. A memory our president vows to lay to rest in 2017. Toyota at the Geneva Motor Show 2017 | Toyota Europe From a first glimpse of the dynamic new 2017 Yaris, the hot Yaris GRMN, the radical urban i-TRIL Concept to the latest TOYOTA GAZOO Racing machinery – the Geneva International Motor Show is the place every Toyota fan should be. Victory for Toyota Yaris WRC at Rally Sweden For the first time since 1999, Toyota has won a round of the World Rally Championship, a feat achieved on only the second event for the all-new Yaris WRC. Toyota's Journey to Dakar 2017 Dakar’s back for its eighth successive year in South America, join the action and follow the Toyota teams' progress. The Toyota Motorsport Story Our motorsport story began in 1957, when we completed the torturous Round Australia Rally. Since then, we have competed at the highest level of world motorsport, and succeeded in a wide variety of disciplines.